Chlorella and Spirulina are two famous supplements that more and more people are using as they become more aware of the healthy properties of these algae. Spirulina is a cyanobacteria (blue-green algae) and consequently belongs to the “true bacteria“ category. Chlorella, on the other hand, is a eukaryotic “true“ plant. This clearly shows that the name “algae” is a collective term for various organisms living under water, but whose origins are truly different. Organisms living under water and that need sunlight to live are usually classified as “algae”. Both man and Chlorella are classified as Eukaryotes. 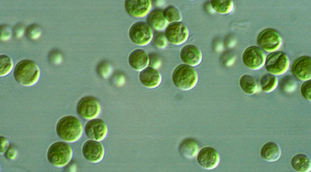 Reduced to phylogenetic relationships, it means that man is more closely related to Chlorella than Chlorella is to Spirulina. Spirulina is a blue-green coil shaped cyanobacteria that can be found in either fresh or salt water. 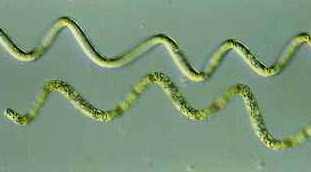 Spirulina lives in oceans throughout the world. Chlorella is a spherical green true alga that requires only carbon dioxide, water, sunlight and small amounts of minerals for reproduction. Chlorella has been determined to contain about 45% protein, 20% fat, 20% carbohydrates, 5% fiber, and 10% minerals and vitamins (including the vitamin B12 which is generally only found in meat). Chlorella contains 20 amino acids including the 8 necessary for human diet. Spirulina contains between 55% and 77% protein, but is considered to be a total protein. It includes all of the 8 amino acids that are necessary as well as 14 other less-essential amino acids. Chlorella is probably the most studied plant in the world as it has been used for over 100 years as a model organism in botanical research. Its effects on the animal and human organism have been the subject of scientific studies for around 80 years. The effect of Spirulina, which in some culture groups has been a regular feature of the menu for many hundreds of years, has been similarly well researched. Their high protein and unsaturated fatty acid content, as well as a variety of vitamins and minerals, make Chlorella and Spirulina valuable supplements to the human diet. Moreover, recent scientific studies indicate that various constituents of these algae have pronounced immune-modulatory properties which make them interesting for applications in the medical field.